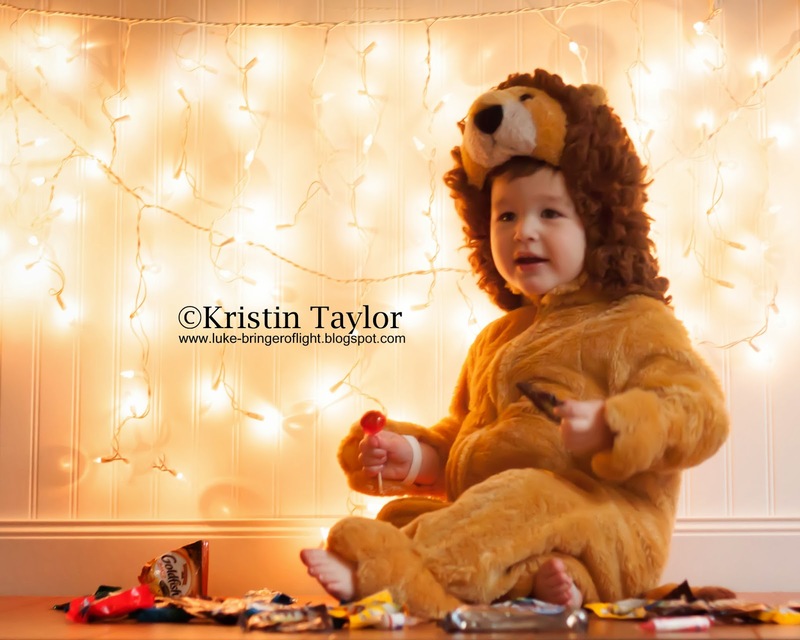 Halloween 2013: Lions, Tigers and Bears, Oh My! I failed to get some photos up here the night that we went "Trick or Treating" at our church, where we actually call it "Trunk or Treating"... so here are some photos of our sweeties in their costumes. 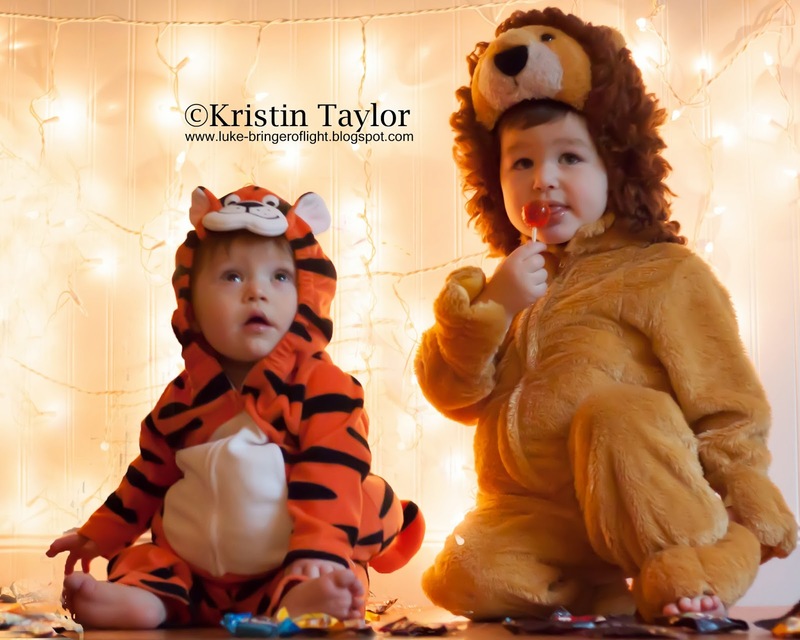 Matthew was a lion and Luke was a tiger. 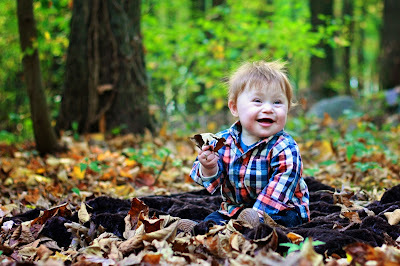 As you may know, Bristol Palin, daughter of Sarah Palin and sister to Trygg Palin, a sweet little boy with Down Syndrome, is featuring an individual with Down Syndrome on her blog each day in October to raise awareness for Down Syndrome. Today, our beautiful little guy Luke was the center of attention! 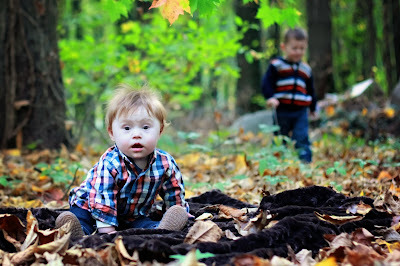 I can't believe she chose him to be featured on her blog today in support of October is Down syndrome awareness month!! Earlier this month, I wrote about a fundraiser that I'm working on to raise money to purchase Christmas onesies for the Cleveland Clinic Children's Hospital Neonatal Intensive Care Unit in Cleveland, Ohio where Luke was born and spent his first Christmas. As I shared in that post, we were unprepared to deliver Luke 3 weeks early and didn't have anything special for him to wear on Christmas Day. Furthermore, we were away from home and away from family. In fact, we were only allowed to visit with Matthew for 30 minutes that day and only because the NICU made special accommodations for us to use a private room so we could all be together for the first time on Christmas. It was one of the most precious 30 minutes of my life and I've linked a video below if you'd like to share it with us! I have been amazed by the generosity of our family and friends and on more than one occasion I was brought to tears by donations that have been made! Today I received a Kohl's flyer in the mail and it included a 30% off coupon, plus Kohl's Cash that starts tomorrow (and one of the managers at our local Kohl's has also agreed to give me an additional 10% off!!). That said, I'd really like to make my purchases in the next few days so I can get the Kohl's Cash to use for additional onesies (and maybe some sweet little matching bows and/or headbands for the girls and some sort of accessory for boys, too) during the redemption period. If you would like to donate to our cause, please use the Donate button or link below. P.S. I researched obtaining some corporate support from a number of baby apparel and toy manufacturers, however they all require official non profit status... definitely something I'm going to consider getting organized before this time next year. I have so many wonderful ideas of how we could support special needs awareness in our community! Another tooth!? It's the bottom middle right one so now both of his bottom middle front teeth are peeking through!! On a completely different subject, Matthew used to yell "Mommy 'mere" or "Daddy 'mere" from his crib in the morning after he'd wake up. It was just about the sweetest sound I'd ever heard. It's lately been replaced with him crowing like a rooster in the screechiest voice he can make. It's bittersweet for sure to watch him grow up! I wish I had saved the link to the article where I picked this up, but somehow I lost it as I was surfing the web. The article was in reference to the "olden days" when parents of children with Down Syndrome (DS) were advised to institutionalize their babies. The author talked about how the world was a better place to live with DS today than it was even in the 70's & 80's although much of that same kind of advice was given to parents long before that time. It's amazing to me as the mom to an almost 10-month old with DS, who is one of two brightest stars (the other being his brother) in my world. A life without either Matthew or Luke is inconceivable. Period. Below is the quote I copied from this mystery author. I loved the first sentence! Love has a way of making statistics irrelevant, and in it, comes a special kind of knowing. 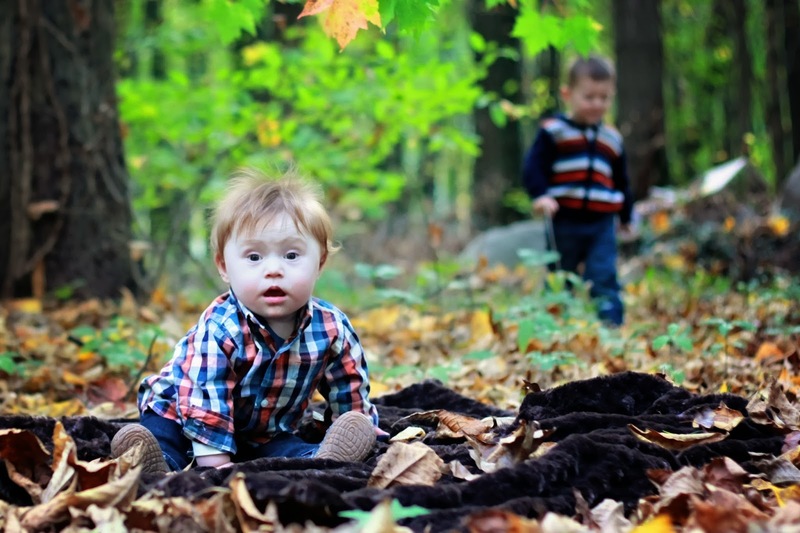 I do not love my son any less because he has Down syndrome. His diagnosis says very little about who he is. He is not a disease or a syndrome but an individual. We've had ourselves a great weekend. We had friends over for dinner both Friday and Saturday nights and we have enough leftovers in the fridge to probably last at least a few days! Both nights were great in different ways and we are so blessed with wonderful people in our lives! Despite battling his first ear infection which we detected on Wednesday after a sleepless night full of tears and neediness, Luke seems to be feeling a little bit better now. 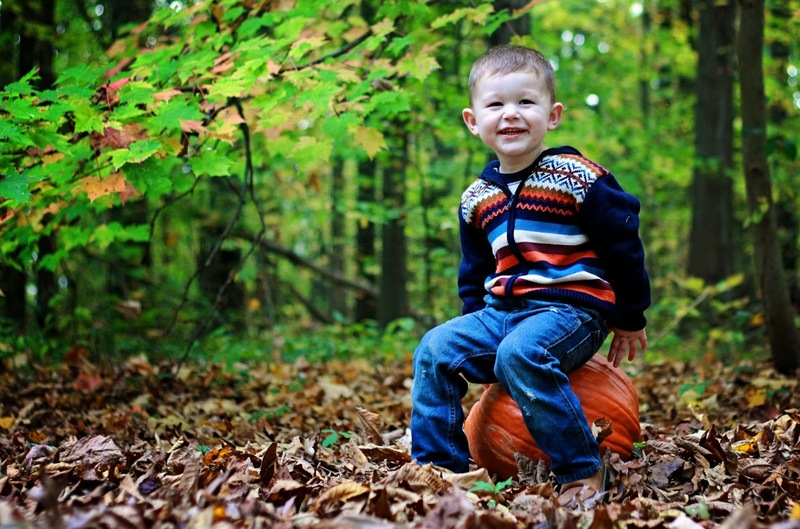 We had been told that because of him having Down syndrome which typically results in affected individuals having smaller than normal ear canals, that he'd likely have recurrent ear infections which would probably lead to him having tubes placed in his ears. 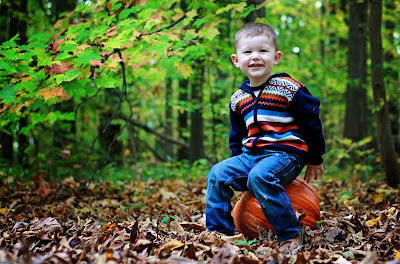 We've been expecting ear infections for months now and are grateful that he managed to get by for nearly ten months before developing his first one. Hopefully this will be an isolated event and won't be something that we find ourselves continually battling for months to come. In just one week, we will celebrate our one year anniversary in our current home. Our surroundings boast a very natural landscape with lots of trees and as such we've been blessed with the opportunity to enjoy the beauty of nature through each season over the last 12 months. Right now of course, it's the fall color on the trees and the abundance of leaves in the yard. 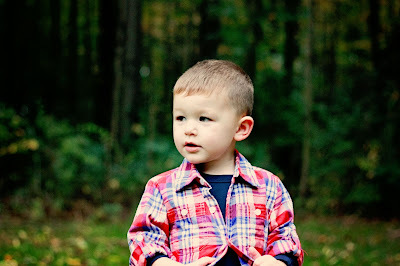 I couldn't resist being outdoors some this afternoon and took some new photos of the boys while we were outside. I know I'm not the only mom to think this about her kids, but seriously I know I have two of the most beautiful boys in the whole wide world! While I didn't get the cliche line "it's not you, it's me", I did get "I don't think I want to see you again", which taken in a different context could have been pretty dang painful... this time though, it was rather exciting! When we had our first consult with medical genetics, I was still pregnant with Luke. We gave our genetic counselor (the assistant to our geneticist) the information about our family tree (it seemed like they wanted to go back about umpteen generations and were interested in every minor thing about every individual) and we also talked about how people get Down Syndrome. The visit was an especially upsetting one for me because I learned that in many instances [most actually], the mother contributes the extra genetic material in the form of a 21st chromosome that causes the baby to have Down syndrome (at least in regards to the Nondisjunction form of DS that Luke has). I've always kind of been a perfectionist... sometimes obsessively... I get annoyed if every strand of hair isn't perfectly straight after I've flat ironed it. My formatting has to be just so when I'm completing computer work. I like to be prepared before attending a meeting. My bed needs to be made if I'm having company, even when there is no chance they will be entering my bedroom. I feel the urge to have seasonally approriate candles. Sometimes I go overboard. I always have more than enough food when we have company. I find myself buying new clothes for special events. I have to vacuum before we have a therapy session for Luke (seriously, who wants to sit on gross carpet?). And although it irritates Dustin a little, I LOVE it when my boys match!! I don't always meet all of my own expections (and I've found that it happens less than ever now that I have two small kids), but I work pretty hard at doing things in a way that "feels right" to me. The idea that I might have been the contributing factor to creating a "differently abled" baby was really tough to take. When the genetic counselor got to that point in our conversation, I lost it. I kept thinking, "What if Dustin blames me?, What if he stops loving me?" Deep down I even thought, "What if he leaves me?" In reality none of things ever happened and honestly, I'd be surprised if he ever even thought any of them. I know that Dustin loves all three of us and I there is no question in my mind how he feels about baby Luke, especially as I observe him almost running to him (and Matthew too) with hugs and kisses after a day at work. So to get back to my conversation with our Geneticist, he told me "You are well adjusted in this role as a mom to a child with special needs, I'm really proud with how great you're doing. Don't sell yourself short. You are doing all the right stuff; you've sought out a great support system (the other moms in the Special Loves Network and a Facebook group that I'm in have been invaluable), you're participating in Early Intervention and have also engaged in private therapies, you're seeing the right specialists and have a great pediatrician. Ms. Taylor, unless you feel like you have unmet needs, I don't think I want to see you again". And just like that... he broke up with me! Adios, amigos! We were released from Hematology last month and now Genetics this month! I feel like with the exception of Cardiology and Developmental Pediatrics, we're probably getting close to splitting ways with some others too! I'd heard that the first year can be brutal as far as appointments are concerned and as we are getting closer to the one year mark, it feels good for them to be tapering off! As far as that whole idea of me likely being the contributing factor to Luke having Down syndrome... the other side is that the next time he does something really awesome, I can brag to everyone that it's because he's 51.07% mom! Last week, Luke turned 9 months old... before we know it, our little guy will be turning a year old! In celebration of Luke's first birthday, I'd like to donate some Christmas inspired onesies/footed sleepers and possibly other gifts to the Cleveland Clinic Children's Hospital NICU where Luke spent the first week of his life, which also included his 1st Christmas. Luke arrived early. We had a c-section scheduled for the morning of January 2nd, 2013, however I went into labor during the early morning hours of December 22nd, 2012. I wasn't well prepared for an early arrival and I spent the first hour breathing through contractions at home while packing mine and Luke's bags. I did not have anything special for him to wear on Christmas and we ended up with a baseball onesie from the NICU sleeper inventory that morning. I mean, lets prioritize... we had a beautiful, stable baby and that was the most important, but it just didn't feel right being away from home and especially away from Matthew. We didn't get to attend the Christmas Eve service at our church nor did we get to wake up to a sparkling Christmas tree. I can't control those things for other families this year, but I can possibly make a difference with what children admitted over Christmas wear on that special day. My goal is to raise $500 in support of purchasing Christmas onesies for babies in the NICU where Luke was born. We have also contacted Carters to ask for a donation. Over the next few days, I will also be reaching out to Gymboree's corporate headquarters as well as other baby apparel makers to ask for their support. 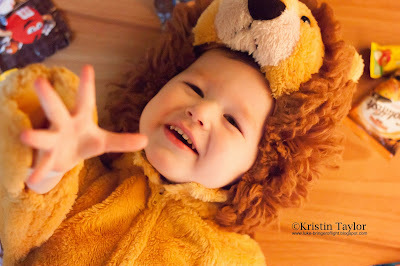 If you feel so inclined, please help me celebrate the gift of Luke by donating money in his name to support our mission! You can donate via PayPal or credit card on the "Donate" button at the top left hand side of our blog! If you have other ideas of how we might gain corporate support, please let me know! Wouldn't it be great if we could extend our goal to include other hospital NICUs and nurseries? ?